Projects Abroad Care & Community High School Special volunteers went above and beyond to raise money for the Salvation Centre Cambodia School 2, their Care placement in Cambodia. The generous donations from their family and friends through GoFundMe will keep classes running until the school receives its regular funding in December 2017. The 60 children who attend the Salvation Centre Cambodia School 2, or SCC2 as it is more commonly known, come from the rural areas in the north of Phnom Penh, the Cambodian capital, and their parents are often unemployed or have passed away. Depending on their family situation, the children use the educational and care activities at the school to supplement their normal education, which may be suffering due to an inability to attend normal classes, or as a primary form of education if their family simply cannot afford school fees. As a non-governmental school, SCC2 does not receive funding from the government and it relies solely on the support from donors to stay open. This year, SCC2 missed the deadline and did not receive the funding they needed. “Without these funds, the school will not be able to stay open and there is no real alternative for the kids. Without SCC2, many of them would just stop going to school,” said Alice Chieppa, High School Special Manager in Cambodia. Projects Abroad stepped in to help and paid the salaries of the teachers for several months but more was needed to ensure the school could stay operational until the end of the year. Once the Care & Community volunteers heard about the school’s predicament, they went about brainstorming ways to raise the money needed to help them. Among many ideas, a GoFundMe campaign seemed most likely to make an impact. After writing the description and selecting photos, the volunteers made the campaign live and started sharing it on social media and sent it to their family and friends. In less than two days, the volunteers managed to raise $3 015, which was $1 015 more than their initial goal. Not only will the school be able to stay open until December, but the extra money raised by the volunteers will be put to good use as the school will be buying new uniforms and educational materials. The children’s families have also been asking the school to provide snacks for the children, to help with concentration during the day, but this is a request that the school has been struggling to meet. Now, with the extra money, they will be able to ensure that the children are fed and able to focus properly during their classes. On top of the money the volunteers raised, they helped with various activities around the school during their project. They taught English to the children, showed the children how to recycle and worked with them to clean the school, painted several walls with educational murals, built flowerbeds and fences outside the classrooms and completely renewed the library with new carpets and a coat of paint. 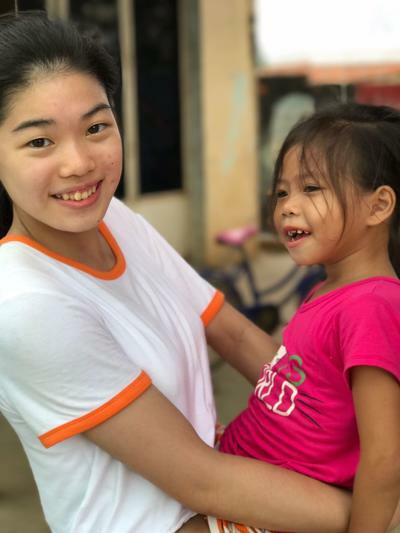 The High School Special Care & Community volunteers were only in Cambodia for two weeks but they have left a lasting impact on the children at SCC2. “It is definitely a great satisfaction for all of us to know that our volunteers and their friends and family could make such a great impact. I think it was important for the volunteers to realise how much their help meant to the school. Activities such as teaching have an impact, but this is hard to see, especially if the volunteers are in destination for only a couple of weeks. The campaign was something put together by these specific volunteers and they were able to see the outcome while they were still in Cambodia,” said Alice. Find out more about our High School Special Care & Community Project in Cambodia to see how you can contribute, or take a look at how you can make a difference at one of our wide range of Care Projects around the world.